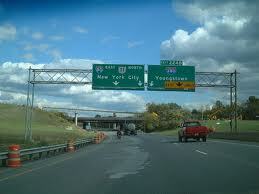 I was born before freeway construction began in Youngstown, but not so early that I remember the area before freeways. When I was about 6 or 7, I remember going out with my dad and walking on the roadbed of what would become I-680 on the West Side going from the Oakwood Avenue entrance toward Steel Street and the underpass at Mahoning Avenue. My dad was fascinated with the pile drivers because at that time he worked for a company involved in the manufacture of the concrete piles that would make up the foundation of the bridges. Mostly, I remember rough walking, lots of piles of dirt, and wondering whether it was really OK to be there. But I figured if anyone were to get in trouble, it would be my dad–after all, I was just the kid! We went for rides on the freeway after it opened. At first there was just a section from the west side (and then, I don’t believe it initially extended to Meridian Road) over to South Avenue, running along the south side of downtown Youngstown. How amazing to whiz past downtown at 50 mph and get over to South Avenue in under 10 minutes! I think many of us in the city thought only of the convenience the new freeways offered. While I was dating the girl who became my wife, I-680 was extended to and beyond Midlothian Boulevard. She lived on Midlothian, just east of the new freeway exit. The new freeway cut about 5-10 minutes off the trip over to her place, which I previously made on surface roads from South Avenue. Similarly, the Madison Avenue freeway made travel to St. Elizabeth’s and Youngstown State a breeze. I-680, and the other freeways around Youngstown changed the city in other ways that we probably didn’t think of at the time. For one, the I-80 bypass on the north side of the city meant that many people who once would stop in Youngstown on their way east or west saw the city merely as an exit sign. The freeways facilitated travel to suburban shopping centers like Southern Park Mall and Boardman Plaza while bypassing downtown. It also meant we could connect more quickly to interstate highways that would take us to Cleveland or Pittsburgh and sports and entertainment options in those cities rather than our own. Those who have studied freeway construction talk about how freeways isolated neighborhoods from each other, contributing in many cases to the decline of urban landscapes. Also, people lost homes and had to relocate because of freeways going through neighborhoods. What these statements describe are the deaths of neighborhoods. What the plan describes is a transition in these areas to “green industrial” which has in mind warehouses and other light industrial uses of a non-polluting nature. Cities do change and I don’t know enough to pass any judgments on these changes. I simply would observe that freeways were and are part of the factors contributing to those changes, as portions of a larger community are isolated from the rest. While we can’t roll back the clock, I wonder if we can learn from the changes and unintended consequences of freeway development and think more carefully about how construction and transportation and zoning changes might affect the fabric of the places we live. I would be interested if there are others who can tell stories of how the freeways in Youngstown changed neighborhoods they were familiar with. Were the advantages of travel worth the changes? Going to high school in the late 1990’s, I had a friend who lived on Dearborn Street, just off Burlington. At the time, this was a large hill that at the bottom led to 711. Once the plan for the 711 Connector was finalized, she knew her house was coming down, as did many of those occupied houses in that strip. There were still a number of families down there but the new connector pretty much killed those few blocks. Bob, like you I watched the freeway construction in Y-town. The construction split my street (Lakeview) apart and I remember having to travel a longer route to get to my school–Holy Name Elementary School. I appreciate your comments about neighborhoods being split. However, I think the freeway system eased travel and saved time for all of us. The entire country benefitted from the fine system of freeways and turnpikes.